Chris Christie's endorsement Friday of Donald Trump was payback for Marco Rubio's bitter attacks on the New Jersey governor during the Republican presidential campaign — particularly in New Hampshire, where a pro-Rubio super PAC's assaults on Christie were so fierce that he finished sixth in the primary race. "This is payback in that sense," pollster Matt Towery told Newsmax in an interview. "There's no love lost between Christie and Rubio. "This was a counter-move," he added. "This was a move to counter whatever attention Rubio might've picked up [Thursday] that is a mark of a master strategist. "It adds to my now-growing belief that Donald Trump is not some political novice, but in fact has a politically strategic mind that is far more sophisticated than most GOP consultants. "What this has done is the art of the deal," Towery said, referring to Trump's 1987 best-selling book. "This had to be in the works. Trump had it in his back pocket." In the stunning announcement at a rally in Fort Worth, Christie proclaimed that "there is no better fighter than Donald Trump." The New York billionaire then unleashed a raw assault on Rubio, who tore after him during the Republican debate the night before in Houston. Trump called the first-term Florida senator "a nervous basket case," ''a choke artist," ''a frightened little puppy" — even insulting the size of his ears. "This is a low-life," Trump said of Rubio before bashing Texas Sen. Ted Cruz, who also slammed him on Thursday. "Cruz lies, but at least it's reasonable lies," Trump said. Before Christie's announcement Friday, Rubio poked at Trump, saying that the developer might have wet his pants backstage during the debate and attacked the typos in the front-runner's Twitter rant. Christie's endorsement also buried the rift between he and Trump — and they, too, traded barbs before the governor dropped out after the Feb. 9 New Hampshire primary. In a December debate in Manchester, Trump ripped Christie's controversial embrace of President Barack Obama during Superstorm Sandy in 2012. "When I saw it, I said I think he's going to vote for Obama," Trump said. "Honestly, it was terrible. 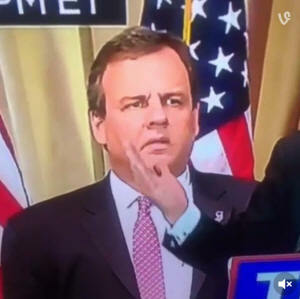 "That was where they had the flood, they had the hurricane and Obama went to New Jersey and … he was like a little child, Christie." Christie: "I like Marco Rubio, and he’s a smart person and a good guy, but he simply does not have the experience to be president of the United States and make these decisions." Rubio: "Under Chris Christie’s governorship of New Jersey, they’ve been downgraded nine times in their credit rating." Christie: "That's what Washington, D.C., does: The drive-by shot at the beginning with incorrect and incomplete information and then the memorized 25-second speech that is exactly what his advisers gave him. … They expect you to plow the snow. They expect you to get the schools open. … None of that stuff happens on the floor of the United States Senate." Rubio: "Chris, your state got hit by a massive snowstorm two weeks ago. You didn’t even want to go back. They had to shame you into going back. And then you stayed there for 36 hours and then he left and came back to campaign." The exchange laid bare a brawl that had been playing out for weeks on the airwaves in the Granite State, led by the pro-Rubio group, Conservative Solutions PAC. The organization's leaders include J. Warren Tompkins, who has worked on the campaigns of Presidents George H.W. Bush and George W. Bush, according to reports. The PAC had raised as much as $31.9 million at one point last year. 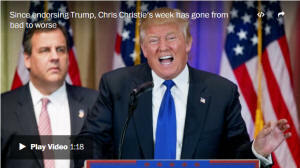 The group released two attack television spots that bashed Christie in the weeks leading up to the primary. 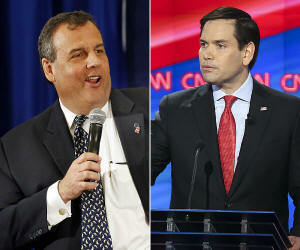 One even declared that Christie "could well be Obama's favorite Republican." "One high-tax, Common Core, liberal, energy-loving, Obamacare-Medicaid-expanding president is enough," the ad said. The spots led The Washington Post to declare that "it's really Rubio's campaign, and its allies, [who are] running the most traditional negative campaign" in New Hampshire. Christie quickly shot back, charging to the Post that Rubio was not "going to be able to slime his way to the White House. "He wants to put out a whole bunch of negative ads? Go ahead," the governor said. "I hope that he will acknowledge at some point that I couldn’t care less." In the polls leading up to New Hampshire, Christie was just two points behind Rubio — and Conservative Solutions had been ramping up its presence in other such key early voting states as Iowa and South Carolina since December. Christie finished the Granite State's primary with 7.4 percent of the vote, behind Rubio, who took 10.6 percent. Towery told Newsmax Friday that, while Christie's endorsement could be seen as payback, it most likely reflected insight into a possible Trump administration. 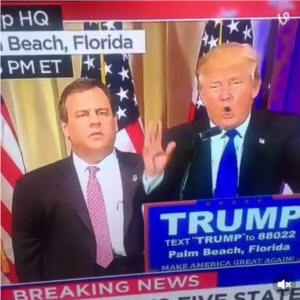 "You don't think that Donald Trump is going to be looking at Chris Christie to potentially be the next attorney general of the United States?" he asked. "I'm not saying that a deal like that has been cut, but I'm saying that's far more likely. "For Christie, this is a great opportunity," he added. "He's not going to get anything from Marco Rubio. He's not going to get anything from Ted Cruz — and the probability that either one of those is going to be the nominee has dropped substantially. "He knows it drops even more with Chris Christie's endorsement," Towery said of Trump. "That is brilliant."